A few months ago, I wrote a post about George Gaspar, the guy who put 2,222 toothpicks into his beard. Well, via the magic of the Internet, George got hold of my post and sent me a very nice email back, thanking me for the coverage. Since I’m insatiably curious, I just had to ask him a bunch of goofy questions and he was nice enough to give me permission to post them. But before I got into the questions, he answered my comment regarding shampooing/conditioning his beard. Thanks again for the compliments, and yes, I do use a lot of shampoo and conditioner. Actually Beardsley brand shampoo and conditioner! It’s been a long road growing a beard like this and it was nice to be appreciated for it! Not a problem. I’m glad you and your wife liked the line about your luxurious chin pelt! I’ve always wondered how somebody could grow such epic facial hair without it getting all matted or breaking. Every time I’ve tried to grow my beard out, it gets to about two inches at the chin and then just kind of stops. I guess it’s because I wasn’t conditioning! As for beard length, I think everyone is different. Since having a beard I’ve met many people who ask a similar question about how it grows long. I think it’s just different for everyone, some people’s beards do just stop at a certain length and some can keep going. It’s such a weird thing! I do shampoo and condition daily. It’s funny, people always think that guys with beards are lazy and they just don’t want to shave, but it’s actually more work to keep a beard this long! Shaving would be quicker and easier! How long did it take you to get your beard to that length? Are you going to try to go for 3000 toothpicks? Or contact the Guinness people and see if you can’t get your name in the book? How did you talk your wife into letting you grow/keep that? I’m full of beard-related questions! I’ve been growing this particular beard for about a year and a half now. I started in August of ’07. If you want you can check out my pictures on my MySpace page. I have monthly shots of the growth. As for the wife letting me part, well it was tough! I actually started growing it for the World Beard and Moustache Championships. They happen every 2 years and when I first heard about them it was about 2 months from the last one, not long enough to grow anything. Well after they passed I really got excited and decided I want to go to the next one. Well the next one is in May of this year, so I started growing the beard. Since my wife knows there is an end date to it, she tolerates it. It’s really just the moustache area that is the biggest problem. I don’t trim it at all so it’s really long and simply gets in the way! I’ll be sure to cut that right after the contest, as for the beard, I don’t know. I really like having it now. Going back for 3000? I doubt it, unless someone asked me to, to film it or something. I could have easily fit more in, it was just taking so long and I had other stuff to do so we just stopped where we did. I liked the number 2222 so we stopped there. I would like to have a shake out with out the garbage bag under it, just free flowing; I think that would look cool! I don’t know if this is any kind of record or anything. I didn’t do a thorough research on the subject, I just typed it into a couple place and the highest number I saw anyone doing was 2000 so I wanted to go higher. It was all for fun, I had no idea anyone would ever see it around the web. I just thought I’d show my family and friends and we’d get a laugh! How long did it take you to stick the 2222 toothpicks in? It took an hour and a half when we made the video. That was with stopping and taking pictures and filming and just goofing around. I’m sure I could do it faster. I’ve tried pencils before, but just like one or two. I never got a box and tried that. Maybe I’ll have to give it a shot! I have a loose beard style, not overly course and dense, so I don’t know how well they would stay in. A few times I tried messing around with moustache wax, but it really pulls the hairs out, so I stopped. I’ve never braided it or anything, just because I didn’t want to rip a bunch of the hairs out. It takes too long to replace a pulled hair when they get to this length! Have you ever thought about having your beard braided so you’d look like a Tolkien dwarf on Fellowship picture day? “a Tolkien dwarf on Fellowship picture day?”–another great line! I see why you are a writer! First chin pelt, now this! 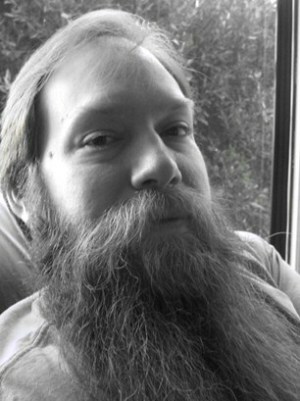 George is a proud member of Beard Team USA, and he competed in the World Beard Championships in May. I’d like to thank him personally for emailing me, and I’d like to thank him more for letting me interview him. Also, I’d like to apologize to him for not getting the interview up sooner, as we’d done most of the communicating way back in February when I first posted the video, but I’d forgotten about it until now when I saw Neatorama pimping the beard video again. Thanks again, George! As always, for more beard information, visit Beards.org!